-Excellent size, frame and length for a center. -Great instincts as a shot blocker. Rotates well. Alters shots. Very good timing. -Very good shooting touch. Capable out to 3-point range. Comfortable in mid-range spots. -Upside offensively. Can get to a turnaround jumper comfortably. Fundamentally sound rip-through from 17 feet. Pretty good touch on right handed jump hook. -High IQ. Good passer. Knows where to be on the defensive end. -Plays with great effort. Works hard on the glass. -Lacks mobility. Struggles getting up and down with fluidity. Runs awkwardly. -Huge feet slow him down. Has issues hedging and recovering. -Lacks explosiveness. Not an above the rim guy. -Not comfortable turning over his right shoulder. -Lacks go-to moves on the block. Doesn't get deep position. Outlook Turner has an intriguing blend of shooting ability, basketball IQ, shot blocking instincts and rebounding ability for a near-7-footer. The Texas-bound big man does some nice things on the floor that should translate well to the next level. 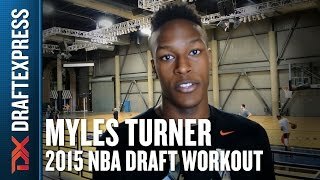 Turner's potential is a bit limited by his lack of mobility and explosiveness, however. He's not exactly great in one area and although he certainly has some NBA-level skills and tools, he struggles to get off the ground quickly, keep quicker bigs in front and hedge and recover in the pick and roll. Turner figures to face questions about his long-term durability due to his abnormally large feet and awkward running style. Turner certainly has the tools to contribute at Texas and eventually parlay that into a potential lottery selection in the 2015 draft. But because of Turner's lack of athleticism along with questions about his long-term durability, he doesn't quite have the star potential people may have envisioned in the past.